Sweet! How come I never find junk that looks that good? Usually, when I tumble over something like this, the tube is smashed or it’s completely fried, which is why it’s being thrown out…. Just get a house in the nice upscale neighborhood near MIT and wait. Mmmmm. Transmission of time in addition to those wonderful cathode ray radiation waves. Cool hack though. Who throws away otherwise functional ‘scopes though? @N0LKK makes a good point. I’ve got a collection of cameras, computers, salvaged parts, and (gulp) functioning calculators that are usable and of value to *me*. But, if I suddenly stepped off, given my family’s previous habits, most of that would hit the trash (or e-cycling, at best) out of convenience… unless I’d gone to the trouble to document how to parcel them out to interested parties. At this point I have to mention Freecycle, a public mailing list that aims to redirect useful but unwanted items from the rubbish heap to a new owner. I’m giving away tons of stuff this way, everything from old calculators to sofas, and the average time between post and response is five minutes. Makes people happy, relieves me of schlepping the stuff anywere, and is way faster than bothering eBay with a $2 used item. “Average wait time” — well, I should say, that’s my experience, at least. Also, I forgot to mention that the list is divided into local groups so you don’t publish to (or query) the world. and I’m not affiliated in any way. Noboby makes a dime on this, anyway. That reminds me of one of the saddest days I’ve known. There was an electronics surplus store here in OKC (where anything but a radioshack is nonexistent). This guy had everything from bulk caps and resistors to knobs, pots, stepper motors and even Tubes still in boxes. He bought a lot of surplus electronics from the military and who knows where else. I went in one day and he didn’t look well at all. He said he had liver cancer. I went back a couple months later and the place was closed down. I saw the guy that own the shop next door and inquired about it. He said that Dale had passed away and his wife had the whole contents of the store hauled off to the trash dump. Gak! Accidentally reported your comment when I meant to hit Reply! Onto the main point: This Heathkit may be as functional as the day it was made, but, if you look closely, it doesn’t have any trigger controls! That means you have to tune the vernier frequency control to get the trace frozen (more like, very slowly sliding sideways) on the screen. In this age when you can buy a new 100MHz DSO for a few hundred bucks, the value of a triggerless tube ‘scope that has only fixed DC input coupling is marginal at best. Certainly one can find some uses for such a beast: as a clock, a tool for learning how vacuum tube circuits worked (as an example of a working circuit), a room heater, and probably more. But “diagnostic tool” would not be high on that list. Ah yes oscilloscope in the trash. Reminds me of the HP180A oscilloscope I found in a recycle bin covered in snow, knocked most of it off and let it sit open for a few weeks and it works as well. by open i mean i took the removable modules out, this one had the 1801A dual channel vertical 50Mhz amp and 1820B time base modules in it still. Wow, great PICK! 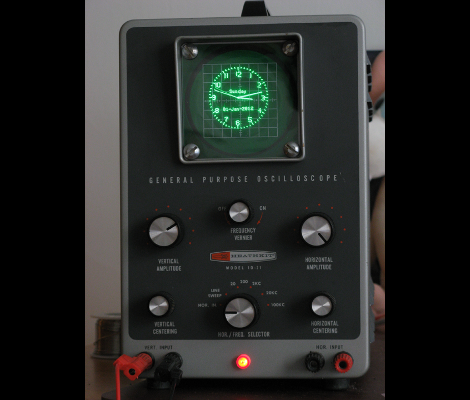 I have a Heathkit scope that I restored with a similar size CRT, but the body is much much smaller… basically like ultra-portable version of this one. This would be a neat hack to it, but I wouldn’t really want to leave it POWERED on all of the time. In the event the plan is to operate the clock 24/7, wouldn’t a screen saver be warranted? Then again 24/7 operation may be likely to be noticeable on the power bill, and 24/7 operation curtailed. Then when someone will asks Bob what time it is, Bob will have to reply wait until the tubes warm up, and I can tell you. :) Put me on that list of those who never find clean operable gear,vintage or not, destined for the landfill that I can rescue. N0LKK, according to the scope’s manual, it uses 40 watts. That’s a lot for a clock, but it’s “only” about $60/year. My first thought went to Fallout, but then the game is set to have a very 60s feel to it. curb-shopped stuff that does not have an obvious defect works perfectly more often than not. People are stupid^H^H^H^H throw away stuff for a variantly of odd reasons, not just because it’s broken. I’ve pulled an engine stand out of the dumpster at a self-storage place, where someone probably paid monthly to store the thing. I’ve also gone to a yard sale, and not bought antique paper-hulled shotgun shells, then later that evening pulled the very same live ammo out of the closest available dumpster. For some reason just finding live ammo in a bin like that really worries me, isn’t there laws about disposing of stuff like that? I’m only saying this cause im from the UK were most firearm related stuff is controlled rigorously haha.